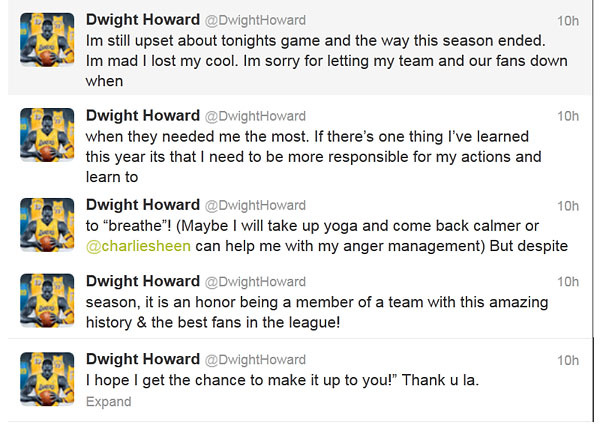 Drama seems to follow Dwight Howard wherever he’s at. He was like a petulant child in his final days in Orlando, holding the team hostage for months because he couldn’t make up his mind. Now, the drama has shifted to Los Angeles where Howard is again at the center of a firestorm that will undoubtedly exhaust the Lakers franchise this offseason. Howard will be a free agent this summer and could leave L.A. for another city. In what may be his final game in a Laker uniform, Howard scored seven points, grabbed eight rebounds, and had five turnovers in just 20 minutes because he was ejected in the third quarter for arguing with an official after he felt he wasn’t getting the benefit of the calls against the Spurs big men. Howard walked off the court, briefly ran into Lakers general manager Mitch Kupchak in the tunnel and had some choice words about the officiating. It wasn’t exactly the image the Lakers envisioned when they acquired Howard during the offseason. He was suppose to help Kobe Bryant win championship ring No. 6 and serve as the Lakers’ next great franchise player of the future. The season didn’t go as planned and, when the Lakers needed Howard the most, he folded his tent and literally left the building. As much as we’d like to think that Howard didn’t quit on his team, it certainly begs the question. Charles Barkley said Howard needs to spend more time with former Rockets great Hakeem Olajuwon and learn some post-up moves because Howard is severely limited when it comes to low-post skills. “He doesn’t even know how to post up,” Barkley said. “He’s a very good rebounder and shot-blocker, but offensively he hasn’t gotten better. From strictly a financial standpoint, it would be better for Howard to re-sign with the Lakers because the team could pay him a five-year, maximum $117.9 million contract. If he signed somewhere else, he’d only get a four-year deal worth around $87 million. Howard would have to walk away from $30 million on the table if he decides to leave the Lakers. That alone should be an indication that Howard is leaning heavily toward re-signing with L.A., which is not good news for Lakers management because — based on the last two seasons — he has proven be undependable and unfit to be the face of a franchise. Howard says he’s going to reflect on the season and clear his head. What the Lakers should do is clear his locker room and plan on not having him for the foreseeable future.